Discussion in 'PC - Re-Logic' started by Cenx, Sep 24, 2014. Oh, and we’ve also improved their AI – for example, you won’t have to deal with the Merchant standing in front of your chests/piggy banks anymore (seriously, what was he doing there anyway)? 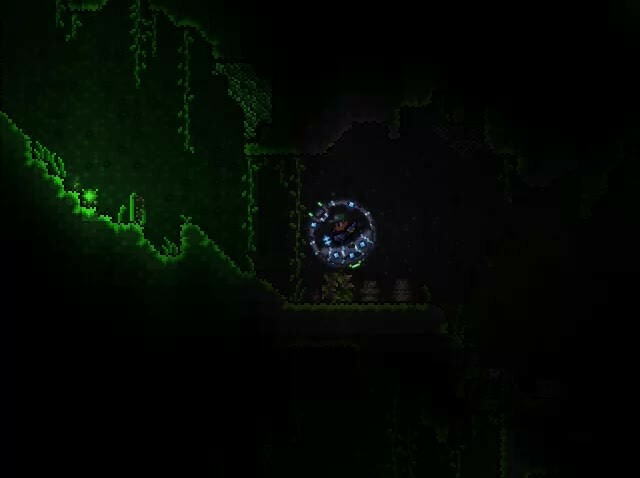 Terraria 1.3 will introduce some subtle – yet exciting – changes at the Worldgen level. First and foremost, starting areas will be cleaned up and smarter. In addition, a handful of Mini-Biomes have been added for intrepid explorers to discover. Terrarians have always been a little “stretchy” in the torso – and quite visibly so when running! Lazure is taken care of that by putting that spring in their step. The end result is that your character will look much more natural as he/she runs around in their world! Interestingly, the rumors of Redigit’s fully moving on may have been a bit premature. He is back in the lab, cooking up something devilish to torment even the most hardy of Terrarians! Finally, we would like to announce that Loki is now a part of the Re-Logic team. He will be handling the role of Community Manager across all of our games - Terraria and beyond. Please join us in welcoming him to the team! That’s it for now. We can't wait to hear your reaction and wanton speculation based on this latest round of 1.3 information. Stay tuned to Terraria.org and the Terraria Community Forum for future spoilers, news items, and community features in the weeks ahead! Aedan The Borf, TheJoekster, BattleDragon45 and 358 others like this. The Crimson is getting a bit of attention in this update. When smart cursor is enabled stairs will place automatically. Something Yorai has been working on...I will let you speculate. One of the three new mounts! Lazure gave some older NPCs a bit of a facelift. BattleDragon45, Aedan The Borf, Gearzoid II and 357 others like this. Had the opportunity to have a big discussion with my Twitch Chat live to talk about spoilers within this thread, Crowno and Cenx joined us in chat! Teal, Razorpinetree, Jofairden and 75 others like this. GIRGHGH, TinyTony, Conner360 and 19 others like this. LuisNTFT, Palkia the living Palkia, xXDireWolfXx and 1 other person like this. TinyTony, Conner360, Palkia the living Palkia and 6 others like this. Yes Yes, YES! ALL MY YES! Palkia the living Palkia, masamusa99, xXDireWolfXx and 1 other person like this. Palkia the living Palkia, Darkblane257, masamusa99 and 5 others like this. Palkia the living Palkia, masamusa99, xXDireWolfXx and 3 others like this. Awww yeaaaa, keep it up team! Let's see people say they're aren't at least a little bit hyped now! TinyTony, Palkia the living Palkia, Von Voogles Worth and 6 others like this. Finally! i was waiting for NPC updates! Omniwolf, TinyTony, masamusa99 and 7 others like this. Can't wait to see what the minibiomes will be like.Hoping they will be something new and amazing! TinyTony, masamusa99, Von Voogles Worth and 5 others like this. Can't wait! Finally a fix for the NPCs standing in front of the chests! I'm looking at you, Dolbere. Also, could you give a few examples of these new mini biomes you speak of? masamusa99, Von Voogles Worth, xXDireWolfXx and 5 others like this. TinyTony, Von Voogles Worth, xXDireWolfXx and 4 others like this. Kassiewary and Ali like this. Aedan The Borf, Von Voogles Worth, xXDireWolfXx and 5 others like this. OH MY GOSH, SO EXCITED! TinyTony, _AN_GOTHwarCHILD, xXDireWolfXx and 2 others like this. So excited for 1.3, also what is cenx wearing in the first image? Looks similar to cobalt armor. masamusa99, xXDireWolfXx, CoStAs 1 and 3 others like this. Palkia the living Palkia, Darkblane257, masamusa99 and 4 others like this. TinyTony, heman, Von Voogles Worth and 9 others like this.